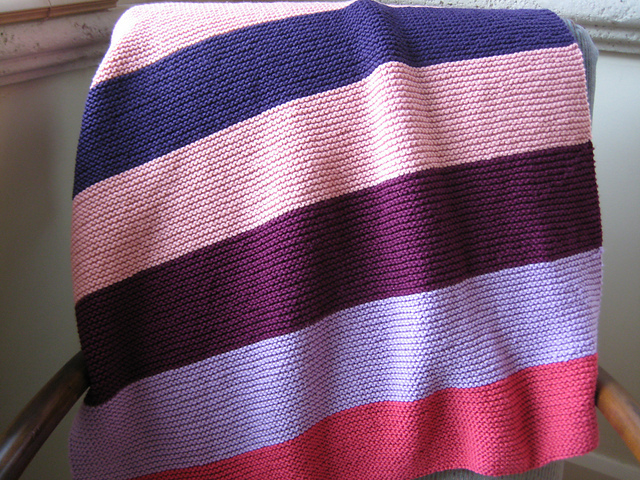 Garter stitch baby blanket. – Carbs & Fiber. When I first began knitting, I dreamed of making delicate heirloom items for my friends’ future babies. (Future babies! They are found in space, mostly.) I think most knitters do this, and for all I know many of them succeed. But the first thing—I mean the very first thing—I tried to knit was a baby blanket. I did finish it, and shamefacedly donated it, but it was not anything I was proud of. So when it came time to make a baby blanket for a real, imminent baby (Imminent Baby is the name of my next band), I chose very carefully. Surely I could handle something called the Super Easy Baby Blanket! It was very easy. The garter stitch, honestly, did get to be a bit much. But I was very happy with the final result.